Quick and easy guide on how to pop popcorn in the microwave using just a paper bag, no oil needed. 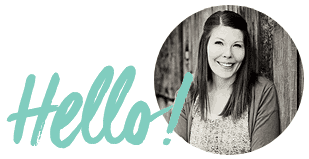 Today I’m talking popcorn. It’s one of my all-time favorite, easy, healthy snacks for the whole family. 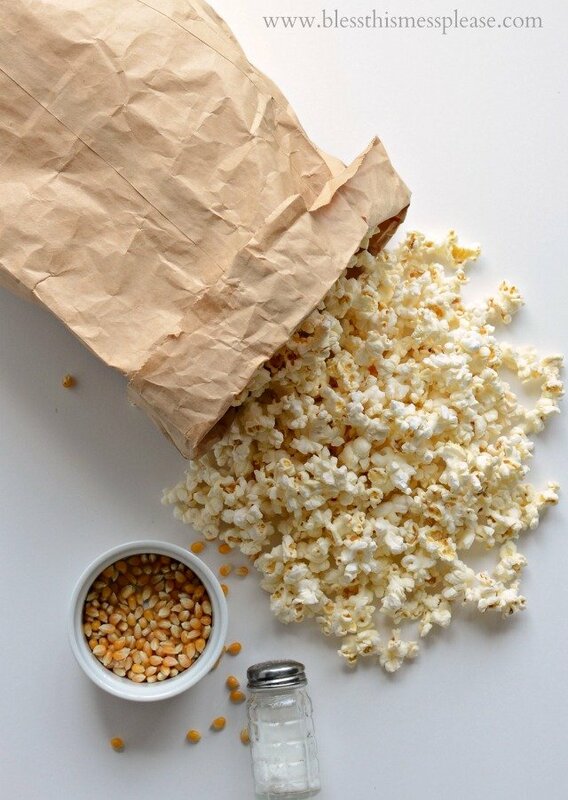 Did you know that you can pop popcorn kernels in a brown paper bag in the microwave?! I didn’t until just a few years ago. I’ve always used an air-popper to pop popcorn and mine stopped working. We are total popcorn nuts and I was desperate to find a solution to my popper-less state! After multiple batches of burnt popcorn on the stove-top, I did a little internet searching and discovered you could pop popcorn in a brown paper bag in the microwave; nothing special to it. I don’t ever cook things in the microwave, and honestly I try to avoid the microwave as often as I can, but this method has been a life saver! 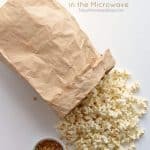 You don’t need an air-popper, a stove-top popper, or any oil, and you can ditch those little chemical-filled bags of microwaved “popcorn” now too. This method is so easy and you can use a few simple things you probably already have in your house. Popcorn is a great whole-grain, fiber-filled snack that everyone loves. Add some real butter and salt and you just can’t go wrong. SO delicious. And because you are only using a microwave, this is something that you could show your older kids how to make on their own. Popcorn popping = life skill. I love popcorn so much I’ve even grown five types of popcorn in my garden. It’s fabulous to eat them all winter! The goal is to pop as many kernels as you can without burning the popcorn. The time that that will take will vary depending on the age and water content of your popcorn, your climate/weather, and your microwave. Don’t walk away from the popping or you’ll end up with a bag of burnt popcorn. Stand there and listen until, after the popping starts going rapidly, you hear a one second pause in popping. As soon as you hear that little break, stop the microwave. 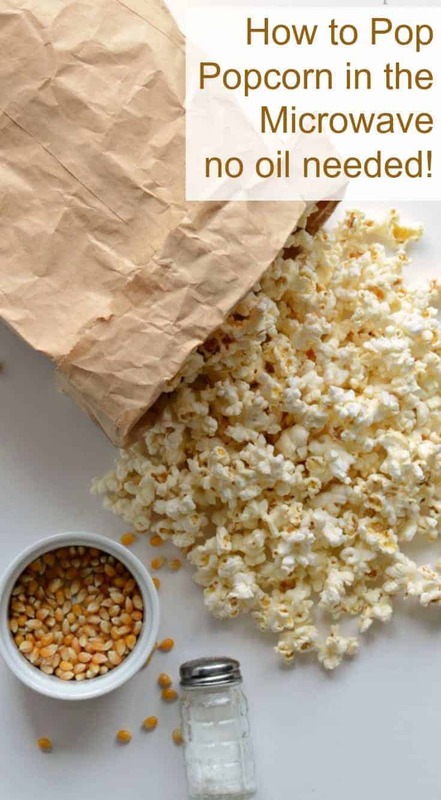 Butter and salt are always a favorite topping but you can also get creative and try recipes like my chili lime popcorn, the best sticky caramel corn, or this fun (non-sticky) spiced caramel corn with white chocolate. All of them are delicious! You can use just about any size brown paper bag that will fit in your microwave. The little lunch sack size is easy to find but there’s a size just a bit bigger than that that works great. Our hardware store carries them and I just ask for an extra one or two as needed. Add the popcorn to the paper bag and fold the top over a time or two. Microwave on high until the popping has a one second gap in it, 1.5-2.5 minutes. Stop the microwave, dump the popped popcorn into a large bowl and season as desired. Repeat as needed to get the desired amount of popcorn. The goal is to pop as many kernels as you can without burning the popcorn. The time that will take will vary depending on the age and water content of your popcorn, your climate/weather, and your microwave. Now you know how to pop popcorn in a brown paper bag! Handy trick, isn’t it? 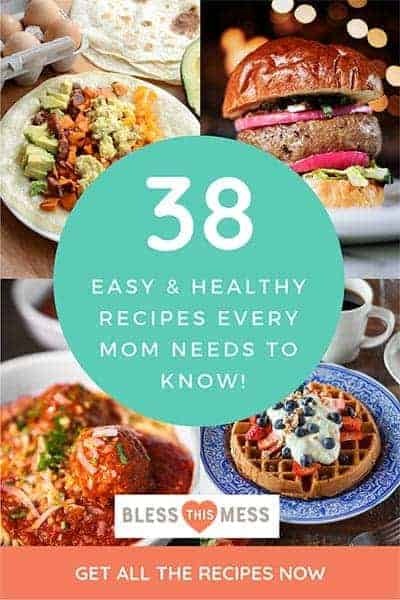 Looking for more healthy and easy snack ideas? I’d start with these no-bake oatmeal bites (the Monster Cookie version is my kid’s favorite), all of these snacks in a jar that you can prep in advance, and we love these easy applesauce cookies that are made with honey and whole grains. Happy healthy snacking friends! This post was originally published in August 2014 and has been updated in January 2018. How many inches wide is the bag supposed to be and where do you get them? I only have grocherie bags or lunch bags. The bag that is perfect is 7 inches wide and 14 inches long. I picked them up at the grocery store. You can use the more normal sized lunch bags, just use less popcorn kernels. I like the bigger bag because I only needed to do two rounds of popping to get a bowl of popped popcorn big enough for us to eat. With the little bag I had to do it 3 or 4 times to get enough. The smaller will work, it’s just less convenient! That is the easiest way to make popcorn, and no nasty for you oils like in the microwave popcorn bags. I use a lunch size bag, 1/4 cup of kernals, and hit the popcorn setting on the microwave. I love this… been doing it for YEARS… probably when we lived by you! Have you ever tried the Kettle Corn this way? I love doing it because, although it has to have oil, I can control how much and how sweet (I like just a LITTLE sweet). The bag takes a lot of the oil (but helps spread the sugar around… that’s why you need it, otherwise it burns), so I have to use a new one each time. This makes enough for me and my hubby, but I double it if I’m adding kiddos. SO good. Oh… and note: the sugar is VERY hot when it comes out of the bag. Try not to touch it for a min or 2 after pouring it out of the bag. This was awesome!!!! Never using oil again!! This is totally making this a happy day – rain and all! We grew our own popcorn when we lived in Oregon, it was so delicious! Chewy and crisp, completely different than the 50 lb bag popcorn in our storage. I mean, I love that popcorn too, but home fresh was AMAZING! Our air popper died 2 years ago, we’ve been popping in brown bags in the microwave ever since. I’m excited to try the above kettle corn! I knew we were meant to be BFF’s Katie! Popcorn lovers UNITE! I can’t wait to try this popcorn idea. Thanks for sharing. My kids love doing their own- perfect snack! I’ve been doing the method for a year or so (I think I saw it on Good Eats). I can’t believe the chemicals they allow in those bags! My favorite combination is to put stevia, cinnamon and a pinch of sea salt on the popcorn. That kettle corn recipe above looks devine. I may have to add that to my list of go to comfort foods! I’ve heard that you can do this, but never tried it! You sure do make it look easy…I’m going to have to finally give it a shot. Just tried this. It worked GREAT! A little butter and salt and it’s delicious…and no greasy film left in your mouth like the store-bought stuff! Thanks for the tip! Nope, you don’t need oil to pop them in the microwave! It’ll work great without it. Thanks for this recipe Melissa. It’s goodbye boxes of artificial microwaveable popcorn in my house from now on and hello proper popcorn. Pinned! We’ve been doing this for 10 years, but just bought a new microwave, and it no longer works. It burns just as it’s beginning to pop, and almost starts the bag on fire. New microwave is same brand and power as the old one. I did notice that in the manual for the new microwave, it tells you not to use paper bags. Sad that we can’t do this anymore ? No! That’s the pits! My microwave is about 12 years old but we have a new built-in one at the house we are building and I was just wondering if this would work anymore. I’ll let you know. It would be a shame if the new microwaves were too much for this because we love making popcorn like this! My daughter wanted pop corn and i did not want to make it on the stove so i googled and found this! So glad i did. Came out great! Please use caution with the bags. 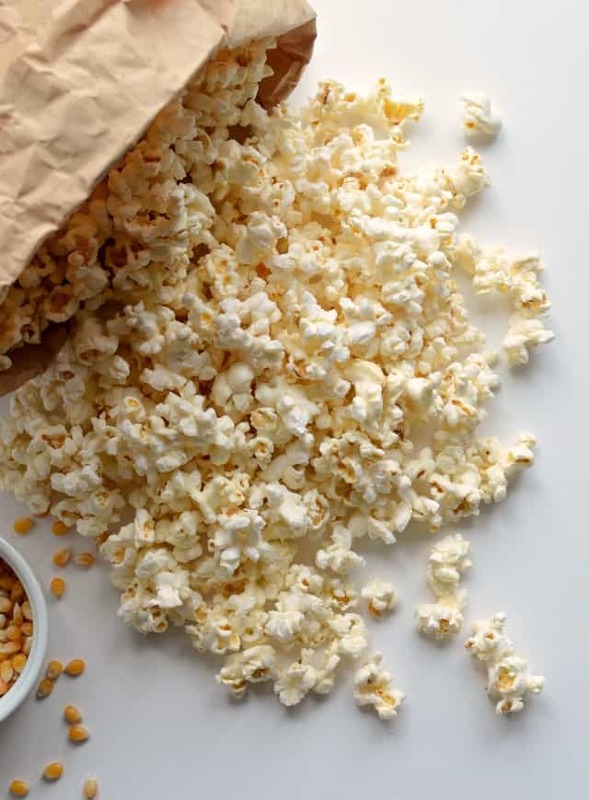 As easy as this makes popping corn…many or most of the brown paper lunch bags have toxic glue that emits chemicals in the microwave, rendering your popcorn toxic. I’ve read the warning articles. Do you know if there is a better option? Say an organic bag with some kind of natural glue? So do you stand the bag up , or lay it down ? Thank you! I used my white paper bag I got from my local crystals store and it worked perfectly! My I pooped kernels was repopped when I put the bag back in the microwave after eating the yummy kernels that did pop which were quite a bit! Out of the 1/3c I got a whole bag of perfectly fluffy popcorn and had about 1/3c left. I found that I could use the same bag 2-3 times. My gem store bag is completely paper so those using non lunch bags may want to be sure the handles ie., have no supporting wires in them which can break a microwave. Other than that it’s just too easy! Ppl asking what size of bag, I don’t get why their asking that… paper bag, does it fit in your microwave??? That’s it! Thanks! It has been many years since I made popcorn in a lunch sack and I couldn’t remember if I needed oil or not. SO easy isn’t it! Glad I could help, happy popcorn popping! I’ve had problems with my bags splitting open at the bottom while popping the corn. They seen to be so thin. Sometimes I have to use two bags, one inside the other. But, over all, I love this method. After popping, I place in an ovenproof bowl, add salt and olive oil and crisp up in the oven at about 200 degrees for a few minutes.